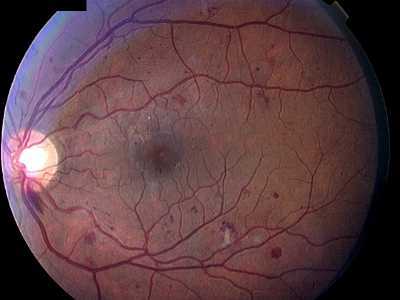 Intraretinal haemorrhages may be ‘dot’ or’ blot’ shaped (termed ‘dot/blot haemorrhages’) or flame shaped depending upon their depth within the retina. The capillary network in the posterior retina is found in two layers; a superficial one in the nerve fibre layer and a deeper on within the inner nuclear layer. Haemorrhage within the nerve fibre layer tends to be flame shaped, following the divergence of axons (1). In the inner layer, haemorrhage is aligned at right angles to the retinal surface and is consequently viewed end-on when using an ophthalmoscope; these haemorrhages appear dot (2) or blot shaped (3). The clinical differentiation between dot haemorrhages and microaneurysms is difficult and of little consequence since both are changes of background retinopathy. Fluorescein angiography will discriminate, microaneurysms lighting up with the dye. Once again, vision is unaffected by these appearances but multiple blot haemorrhages imply significant retinal ischaemia, characteristic of pre-proliferative retinopathy.